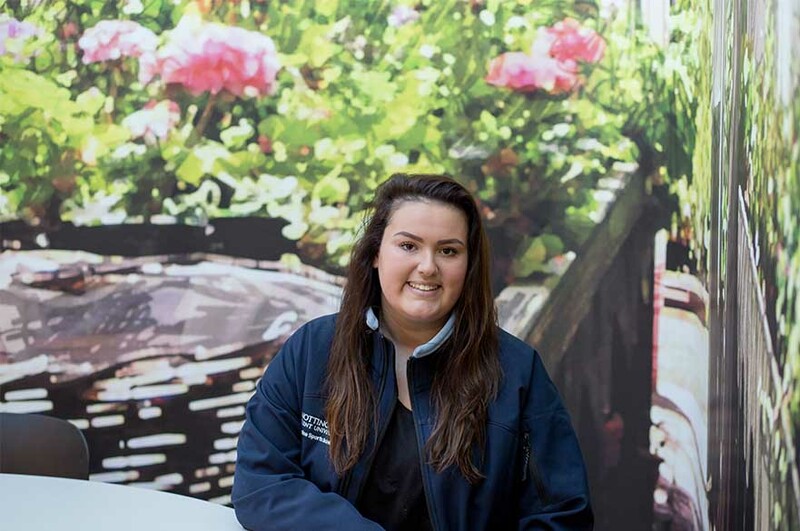 “I am studying BSc Equine Sports Science, I am currently in first year and some course modules include, Equine Anatomy and Physiology, Equine Behaviour and Welfare, and National Equine Sports Industry. These modules are coupled with practical care and handling of the horse, which gives students a strong holistic knowledge. My particular course offers an option for a sandwich year in industry and allows you to pick modules which will support your future career pathway. “I chose this course mainly for how welcome I felt at the open day. The campus is beautiful and the students and staff immediately made me feel settled. The lecturers are all so knowledgeable in their fields and active within research, which means that all the information presented to us is current and relevant to each topic, giving us extra supplementation around each subject area. “Personally, I enjoy the Equine Anatomy and Physiology module the most. I find it fascinating to learn about how all of the systems work so intrinsically with one another. Understanding how the horse works mechanically allows us to care for and train the ultimate equine athlete in a way which supports these systems. I am particularly looking forward to studying the Sports Injury and Equine Disease and Diagnostics modules. It can be a challenging topic, but the lecturers know how to make it fun and memorable! “This course gives students a broad understanding of the equestrian industry and really opens your eyes to current issues and areas of the industry many may not have considered. It is a science-based course, so science is applied into all subject areas giving a deeper understanding of everyday occurrences or tasks. “The lecturers are so helpful and are always happy to support you or give you extra things to do if you are particularly interested in a certain area. Between them, the tutors have an abundance of knowledge across all areas of the equine industry, this means that there is always someone who can answer your questions and give you the most reliable and current answer, as they are all active in their specialist fields. All of my tutors are approachable and easy to talk to which makes everyone feel very comfortable. “The opportunities are endless and if you are serious about a career in the equine industry, this course is for you, I am so glad I picked Brackenhurst and I have enjoyed every aspect of this course and life here so far! “I didn’t know much about Nottingham before coming here but since arriving I can safely say it is one of the best cities (especially for students). There is such a wide variety of things to do including markets, comedy nights, festivals, clubs and bars, amazing shopping and more restaurants than you could wish for! The best part being that it won’t break the bank to have a great time, and there really is something for everyone. “There are so many things to do both on campus and in the city, which is only a 30 minute bus ride away. With the Students Union hosting a plethora of events, there is always something to do. “It did not take me long to settle at all, the staff are all so friendly and with so many events happening in the first few weeks, you very quickly make friends and feel right at home. “I love being a student here, the campus is tranquil and beautiful, there is a bar on site for nights out and events close to home, but the city is only a stone’s throw away and offers so much to do for students.